The Bachelor of Sport and Exercise Science meets the demand for professionals able to provide physical activity services to all sectors of the community. The course provides students with a strong understanding of the processes and mechanisms underlying sport and exercise science, and with the knowledge and skills necessary to manage and plan sport and exercise activities in health, exercise science, sport, event and exercise therapy contexts. Students who complete the Exercise Therapy major (MAJ06234) (not available to international students) are guaranteed entry to the UTS Master of Physiotherapy (C04306) (subject to maintaining a credit average and a successful internal interview). The Master of Physiotherapy leads to eligibility for registration as a physiotherapist in Australia. This course aims to provide graduates with the necessary skills to gain initial employment in the human movement field, as well as the analytical skills necessary for critical appraisal of developments in the field. Career options include sport and exercise science; corporate health and wellbeing; strength and conditioning; personal training; physiotherapy (pathway or guaranteed pathway); exercise rehabilitation; sports coaching; outdoor education; and facility management. 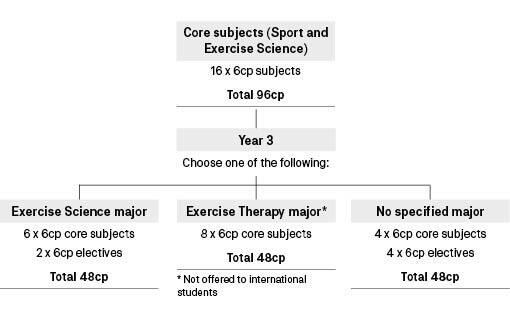 Students must apply through UAC to enrol in the course or specifically in the Exercise Therapy major (MAJ06234) (different UAC codes apply). This course is also available to mature-aged applicants where preference is given to those with vocational experience in the broad field of human movement. After admission, students may apply for recognition of prior learning in subjects in which they consider themselves eligible. Equivalence of subject matter is the main criterion for the award of recognition of prior learning in a subject successfully completed at another institution. The course is available on a three-year, full-time basis. Students should be aware that they may be required to attend evening classes. Students must complete at least 144 credit points over 24 subjects. Students choose four electives or a major, appropriate to their chosen career, to complement the core subjects in the degree. The course has an extensive practicum program. The course programs below include two years of common core subjects, followed by a choice of major (or no specified major) in Year 3, chosen from CBK90911 Sport and Exercise Science Year 3 choice: Exercise Therapy (MAJ06234), Exercise Science (MAJ06216), No specified major (STM90838). The Bachelor of Sport and Exercise Science (Honours) (C09057) is available to eligible students with an additional year of full-time study, or two years of part-time study. Students who complete the Exercise Therapy major (MAJ06234) in this course are guaranteed entry to the Master of Physiotherapy (C04306) at UTS (subject to maintaining a credit average and a successful internal interview). Students who complete this course with the required electives and grade point average meet current entry criteria for the Master of Physiotherapy (C04306). The course is under consideration for accreditation with Exercise and Sports Science Australia (ESSA) for students who select the Exercise Science major (MAJ06216).